This BLOG On FHA Loans With Collections and Charge Offs Mortgage Guidelines Was UPDATED On January 8th, 2019 By Gustan Cho of The Gustan Cho Team at Loan Cabin Inc.
Have you ever wondered about applying for an FHA home loan while having collections and charge-off accounts in your credit history? Are you unsure whether you can get approved for an FHA home loan with collections and charge-off accounts? Yes? Then read on as this post will provide detailed information about qualification requirements of FHA home loans with regards to collections and charge-off accounts. FHA home loan is one of the most popular loan programs in the U.S. because of its leniency. FHA loans are insured by the Federal Housing Administration (FHA). FHA’s role and mission is to promote the ownership of homes in the United States. FHA isn’t a lender and it does not originate loans. FHA is a government agency that comes under the United States Department of Housing and Urban Development. It acts as mortgage insurer where it insures private lenders and banks who originate FHA loans. The lending institution is required to ensure that the borrower meets all the guidelines established by the FHA. If the lender issues a loan to a borrower who doesn’t meet the guidelines of FHA and the borrower defaults on the FHA loan, then the loan will not be insured by the FHA and the lender will suffer the loss. FHA doesn’t require the borrower to satisfy outstanding charge offs and collections to qualify for an FHA home loan. Borrowers who want to get an FHA home loan don’t have to pay off older charge offs and collection accounts. However, sometimes borrowers are told by lenders that they cannot qualify for an FHA loan with outstanding collections and charge offs. Only lenders who don’t follow the guidelines of FHA say these kinds of things. When a debt is deemed uncollectible by a creditor and is written off by them on their books, it is called a charge off. However, just because the creditor has charged off the debt doesn’t mean that the consumer is relieved from paying it. Charged-off accounts are sold by many creditors to collection agencies who try to collect the debt from the consumer. Home buyers with outstanding collection accounts and charge offs can still qualify for an FHA home loan. Delinquent debts are charged off by most creditors after six months. Creditors figure that when the debtor hasn’t made any attempt to pay off their debts in the period of six months, they won’t pay it anytime in the future. Thus, they charge-off the debt and remove it from their balance sheet. The debt that is charged off negatively affects a consumer’s credit as it appears on their credit report. If charge offs are sold by the creditor to a collection agency in return for some dollars, the collection agency will try hard to collect the debt payment including fees and interest. The collection agency or creditor can sue consumer if he/she is unable to pay the charged-off debt. However, mostly creditors and collection agencies don’t sue consumers as it costs them more money in court and attorney’s cost. Debts that are charged off recently will definitely affect the consumer’s credit score and it might affect them in getting loans and new credit. However, over time, the impact of charge-off debts on credit report reduces. Debts that were charged off more than two years ago won’t have any affect on a person’s credit score. But, charged-off accounts stay on a person’s credit report for seven years. After seven years, the credit report of the person becomes clean as charged-off accounts are deleted. Home buyers with outstanding charged off accounts can qualify for an FHA loan. In addition to FHA loan, home buyers can also qualify for Freddie Mac, Fannie Mae, USDA and VA loan as these loans don’t require borrowers to pay off charged off accounts. Borrowers with charge offs and collection accounts can qualify for an FHA home loan with lenders who don’t have any lender overlays. Many borrowers are told by mortgage lender that they can’t qualify for an FHA home loan because of outstanding charge offs and collections. Under HUD guidelines, borrowers can qualify for an FHA home loan with outstanding charge offs and collections, however, some lenders require borrower to pay off collection accounts and charge offs. Borrowers often get confused as lenders tell them things that don’t align with HUD Guidelines on charge offs and collection accounts. The reason is that lenders can have overlays (additional mortgage guidelines over those given by HUD). Many lenders in the U.S. have lender overlays that contradict the guidelines established by the HUD. Requirements on FHA loan are of two types: Lender overlays and FHA guidelines. All lenders are required to meet the minimum FHA loan guidelines and requirements, but they are free to set more stringent lending requirements. Those higher lending requirements are called lender overlays. Borrowers can although qualify for FHA home loan with outstanding charge offs and collection accounts, but some lenders require borrowers to pay off all the outstanding charge offs and collections. This is known as a lender overlay on charge offs and collections. The same case applies to credit scores. The minimum credit score required by the FHA is 580 and any borrower can qualify for a FHA home loan with this credit score with a 3.5 percent down payment. However, some lenders set overlays on credit scores. Some lenders require a borrower to have a credit score of 620 to qualify for an FHA home loan. Collection accounts which are not medical related like outstanding accounts on auto repossession, credit card debts, utilities and other credits are called non-medical collection accounts. Borrowers can qualify for an FHA loan without paying off non-medical collection accounts. However, according to HUD Guidelines, if the aggregate balance on non-medical collection accounts is $2,000 or more, then the lender must include this balance in calculating debt-to-income ratio of the borrower. 5 percent of non-medical collection accounts’ outstanding balance is figured in as a portion of monthly debt of the borrower. For instance, if the total outstanding balance of collection accounts is $15,000, then 5 percent of $15,000 or 750 will used as part of the borrower’s monthly debt payment. This applies even through the borrower doesn’t have to pay any money. The large balance on outstanding collection accounts thus creates a problem for borrowers because it increases their debt-to-income ratio. If the debt-to-income ratio of the borrower is very high, they won’t be able to qualify for FHA home loan. Home buyers with a large balance on collection accounts can get into an agreement with the creditor or collection agency to pay off the collection accounts. Then, the agreement to pay off the outstanding collections can be used by the lender to calculate the debt-to-income ratio of the borrower. In this case, the lender will not use the 5 percent of the balance on outstanding collections. On the example given before, if a consumer entered into an agreement to pay $150 per month on the $15,000 balance on outstanding collections, then the lender will use the $150 to calculate the debt-to-income ratio of the borrower and not the 5 percent of the $15,000 or $750. Medical charge offs and collection accounts are not included in the calculation of debt-to-income ratios. No matter how high the balance on outstanding medical collection accounts is, it will not be included in the calculation of debt-to-income ratios for FHA loan. Mortgage charge off account is unpaid debt that is written off by a lender for tax purposes. These charge offs appear as an owed balance on the credit report of the consumer. 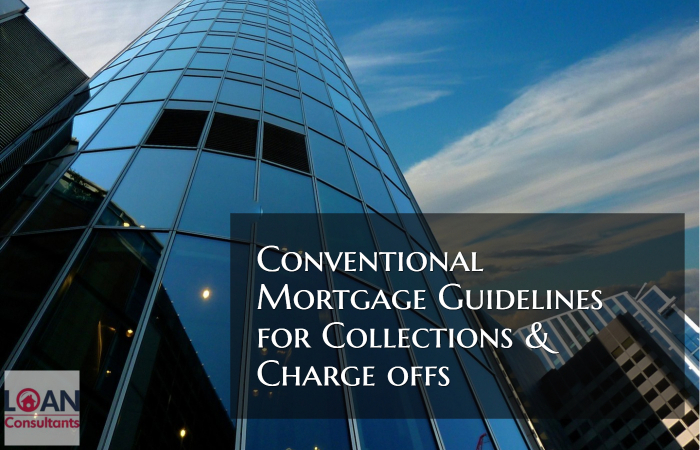 Although FHA ignores outstanding charge offs, but it has specific requirements for mortgage charge off accounts. The consumer who has mortgage charge offs on their credit report must wait for a period of three years before then can qualify for an FHA home loan. As discussed earlier, borrowers can qualify for an FHA home loan with outstanding charge offs and collection accounts. However, those consumers who have an outstanding balance of $1000 or more in non-medical collection accounts with credit disputes must retract those disputes. The credit score of the consumer may drop when the credit dispute is retracted by them. If the consumer’s credit score drops below the minimum credit score requirements of the FHA i.e. 580, then they won’t be able to qualify for an FHA home loan. HUD does allow lenders to completely ignore unpaid charge offs and collection accounts. However, borrowers who have a credit dispute on their charge offs cannot be given a loan. The borrower must get the credit dispute removed; otherwise, the FHA loan approval process will not proceed. Borrowers can have credit disputes on non-medical collect accounts if the total outstanding balance on the accounts is below $1000. Medical outstanding collection accounts with credit disputes won’t have any effect on the FHA loan approval. Borrowers who have unsettled credit disputes on medical outstanding collection accounts can qualify for an FHA loan without retracting the dispute. It won’t have any effect on the mortgage approval process and loan application. A borrower may be told by the lender that they must retract the credit dispute on the medical collection accounts. This is a lender overlay and not a requirement of the FHA. Many borrowers are told by local banks and other lenders that they don’t qualify for an FHA home loan because of outstanding collections and charge offs. As discussed earlier, FHA’s guidelines stipulate that borrowers with outstanding collections and charge offs qualify for an FHA loan, but lenders are free to establish their own guidelines. It is legal for a lender to establish additional guidelines on FHA loan which makes it hard for borrowers with outstanding charge offs and collection to qualify for an FHA home loan. Borrowers with outstanding charge offs and collections should shop around for FHA loans. They should search for mortgage lenders who strictly adhere to the guidelines established by the FHA. If a mortgage lender tells them that they don’t qualify for FHA loan because of outstanding charge offs and collections, they shouldn’t work with that lender. Instead, they should find a lender that says, “outstanding collections and charge offs don’t stop you from qualifying for an FHA loan”. If you have outstanding charge offs and collection accounts and you are thinking about getting a FHA loan to buy a new home, then don’t hesitate to approach a lender. A mortgage lender who follows the FHA guidelines will approve you for an FHA loan with outstanding collections and charge offs if you meet the other requirements of the FHA such as the minimum credit score of 580. So, when you search for an FHA loan find a lender who adheres to the FHA guidelines and don’t work with lenders who tell you that you can’t qualify for an FHA home loan with outstanding collections and charge offs. If you have been denied a home loan or have any questions about real estate or mortgage please contact the author, Gustan Cho the National Managing Director at Gustan Cho Associates at Loan Cabin Inc. at 262-716-8151 or text us for faster response. The Gustan Cho Team at Loan Cabin Inc. works when you work, so feel free to contact him any time.